I run a heavy customized discourse on www.numerama.com/discussions/. Correction of information exchange with the wordpress etc. I don’t have specific any specific timeframe, I would say 2 ou 3 weeks. If you don’t have someone on full-time maintenance duty, I would strongly recommend transitioning away from the advanced subfolder setup and over to our recommended sub-domain scheme, i.e. 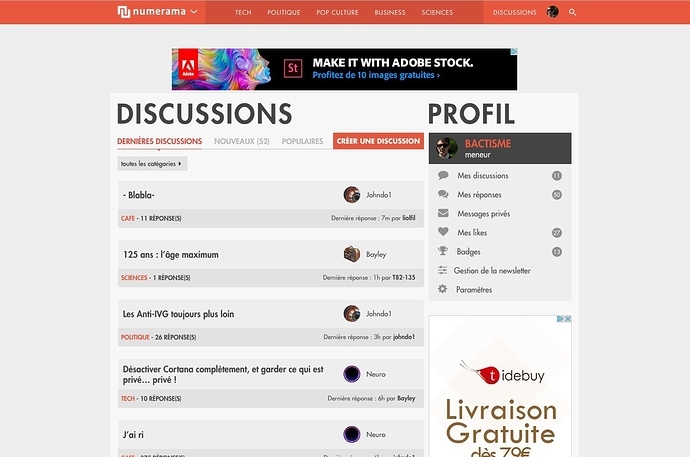 discussions.numerama.com. This will greatly mitigate your maintenance costs. Great looking theme btw! Let us know if you have some feedback for our upcoming Native themes support. The things I hate in discourse is not the maintenance outside docker (it’s actually fairly manageable), but the fact that its developper community force everybody to think docker/subdomain is the only viable option. I have no problems updating the discourse core, the problem is that I override lot of ember template parts, and if they change variables between version, the thing blow up. I am really looking forward to have theme, easy template tools etc. And Also hook, I still cannot modify <title in an plugin. The things I hate in discourse is not the maintenance outside docket (it’s actually fairly manageable), but the fact that its developper community force everybody to think docker/subdomain is the only viable option. The fact that developers are not open on that point make me rage. No need to bring such strong emotions as hate and rage into this. I was merely offering some advice that, to the best of my knowledge, you had not heard before. I’m not trying to force anything on you. FWIW, as a plugin developer and freelancer, I go quiet when I see two conflicting statements from a potential client. If it’s not a problem, why are you asking for help with it? I don’t mean to be argumentative. My typically vetting process has me asking feasibility and complexity questions that these two statements complicate. the problem is that I override lot of ember template parts, and if they change variables between version, the thing blow up. Just a recommendation, I would look to get away from that process as much as possible and use the decorateWidget process. That will keep you from blowing up on every update and costing you money to pay a freelancer to make changes each time. The complexity of the upgrading process is linked to the changing templates not docker. The previous dev was not an discourse expert obviously, and I don’t think he use decorateWidget … another problem to solve. I really want to simplify my over-customized setup and that the reason why I am posting here, looking for some talents.